finally worked it out. Is that TV reception antenna on the back of the Merc? Is it that boring being out in front all the time Lewis wants to watch his favorite soaps? How about a nose ring for the RB's open nostril...or should the car be drug-checked for performance enhancing snorting? @Laurence what do you think about Red Bull nose, it's something can give them any advantage? @marnypopis I'm pretty sure it wouldn't be there without a reason. I'm not convinced it's the silver bullet some people seem to be suggesting, but it's an interesting development and it's not immediately obvious what its purpose is. 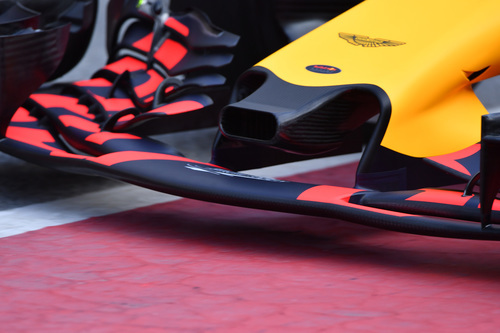 For those who haven't seen the Red Bull nose yet, here's a photo. Stroll sets a new fastest time of the morning with a 1:26.450. Nothing to write home about, but it's still a bit overcast here and the teams are still working through their early checks and changes. Sauber look to have a difficult year ahead with the 2016 power unit. Do you think they could actually not make the 107% time at some tracks ? @lebron Quite possibly. Not only do they have a 2016 power output, they also have an engine with 2016 rigidity. The engine is quite an important part of the structure of the car and Mercedes boss Andy Cowell said a major part of development this year had been making the power unit more reliable and making it heavier to cope with the additional stresses and strains. Could be a very tricky year for Sauber. @laurence: Do you think if this Honda thing does'nt work out this year, mclaren might approach BMW for F1 engines too? @mohijit, Maybe, but BMW have not sounded so keen since they left the sport at the end of 2009. We have our first red flag of the day. Stroll had a spin in the Williams and had to get it pointed in the right direction again before the session was green flagged. It looked like Turn 9, which is a pretty serious corner in these cars, but he managed to finish the spin still on the tarmac, so no obvious damage done. What is Sauber's angle exactly? They don't really develop cars beyond the first chassis.... They don't try to win... They don't really score points... They don't develop talent anymore, they just toss guys away who helped them live like potato peels... They don't seem to make a cent.... Monisha seems like she could care less about racing... Why are they there?? @Keith Money is the issue! The hope is that more will bring a return to the midfield. In 2012 they were still challenging for podiums, but since then a lot has changed - both in the team and the sport. The team now has new owners, so I guess they will be looking to push it back up the grid in the next few years in the hope of a fairer Concorde Agreement post 2020. Speaking of Sauber, their reasoning while going with the 2016 engine was that it would "have the ability to focus more on the chassis development". Do you really think this was the only reason, and not their financial troubles at that time? It might come back to bit them if the Engine can't cope with the current regulations, and they are forced to take extra Engines later on in the year. @Siddhesh, I don't believe it was for that reason. And if it was I very much doubt it will work as they planned. @laurence: Hi, do you think there is a variation of wheel base between the different cars this year? @Yoseph It seems that way. I haven't had a chance to study photos, but the Mercedes definitely has a very long wheelbase. A longer wheelbase means a longer floor, which if you can get it working correctly, means more downforce. That's why we've seen so much attention on the bargeboard area this year, because that is essentially channeling the air to the underfloor of the car. The other thing to look out for is the amount of rake the cars are running - the angle of the floor in relation to the car. Red Bull went extreme with that last year and appear to be doing the same this year to maximise the performance of the diffuser. Ferrari also appears to be running a high rake angle. The trick there is sealing the sides with clever flow structures so that the air does not seep out from underneath the car and away from the diffuser. It's often why you see so much detail on the floors of the car. 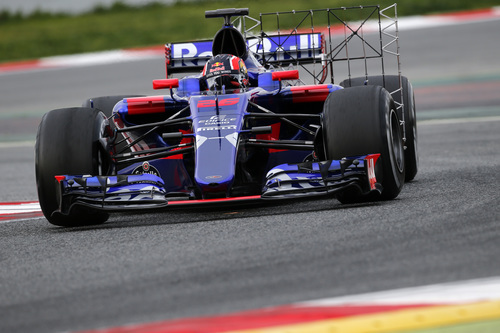 Kvyat is on track in that stunning Toro Rosso right now along with Vandoorne in the McLaren. @mfbull, I'm not going to rule anything out. One theory is that it's being used to duct cooling further down the car, but my guess is as good as yours at this stage. The new regulations are even more painful the sports have gone into something that we are still trying to figure out what the hell man! 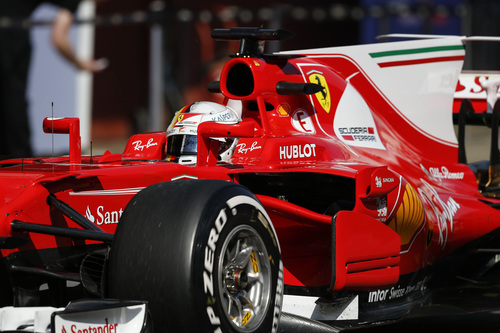 @laurance: Hi, Ferrari seems to be very silent. Didn't see any comments from the team after Day 1. Do you think they are making progress and meeting their expectations? Good morning Laurence, with the re introduction of Shark Fins this year. What is the difference between the Fins on Force India, Haas, Mercedes and STR? @Divij As far as I know they are all trying to do the same thing - tidy up the airflow towards the rear wing. The effect on performance isn't that great, but it's one of those things most teams believe is worth the effort. Mercedes is the intriguing one as we saw it has an opening on top. I'd guess that's some kind of cooling duct, but that is a complete guess at this stage. I believe Mercedes were particularly keen to work on cooling over the winter as that's one of the main reasons they wanted to test in Bahrain. @Victor, I'm not entirely sure which bit you mean, maybe the brake ducts? Ferrari was running blown wheel nuts on the car yesterday, which require extra ducting on the brake ducts to feed air through the open wheelnut in an attempt to manage the flow around the front tyres and further down the car. Here's a look at the brake ducts and wheel nuts on the Ferrari yesterday. As well as the fairly extreme stuff they have going on around the sidepods this year. 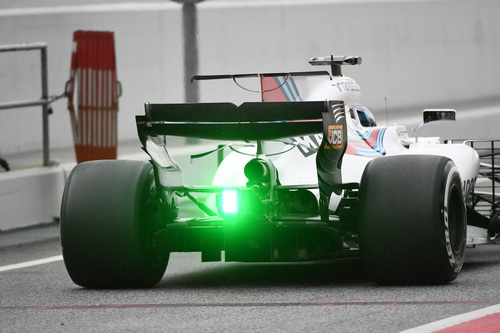 A green rain light on the rear of Stroll's Williams. That's a mandatory thing for all rookie drivers in testing - a bit like L-plates when you're learning to drive. "It is fair to say that the rule changes are much smaller than we had in 2009 aerodynamically, the flow structures around the car are similar to previous generations but obviously different in exactly what happens, particularly the 250 vortexes off the front wing which is the junction between the FIA section and the elements. How that interacts with the car is quite a challenge. Meeting the weight target despite it being 728kg is a challenge. Its getting towards sportscar weight now isn't it." ha! rookie hazing, love it! @mfbull : Thanx for the info. So its less talk and more work approach for Ferrari. Seems like they will maintain a low profile until things get clear in Aus GP. Laurence, what about the Engine noises of Merc, Ferrari, Renault and Honda? Are they different/louder than last year? Noise wise how do you rate? @Sharee Possibly a tiny bit louder, but you can still stand trackside without the need for earplugs. If anything the noises of the engines are closer to each other this year. The Honda used to be the one that stood out from the crowd, but even that sounds closer to the others this year. If you're coming to a race this season, don't expect anything that different to the last few years. @Laurence, will this 'L' tag green light be on his car whole season? @By Cin Nope, it's just a testing thing for drivers with less than two races experience. Ron Dennis off to defence. Maybe he'll get a knighthood for that ? Lots of aero testing this morning with plenty of temporary appendages to measure air flow.